On the morning of February 2, 1995, the Town of Campbell First Responders and Fire Department were dispatched to a home where it was reported that there were three unconscious victims, the Kime family, inside. When Chief Robert Anderson arrived at the scene, he was informed by first responders and the victim’s daughter, Linda Lenox, where the unconscious victims were located within the home. All three victims were transported to area hospitals for treatment and all three victims survived. It was later indicated that the home’s chimney had become plugged after condensation formed and the chimney liner fell down inside, causing the furnace exhaust and carbon monoxide to back up into the home. In early 1995 the dangers of carbon monoxide were only beginning to be known throughout the fire service nationwide, and so carbon monoxide levels could only be estimated due to the lack of detection equipment, but the official estimate was “off the chart” due to how quickly the victims were overcome. 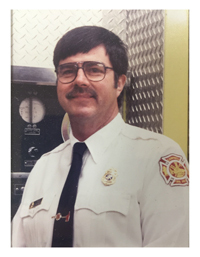 Chief Anderson retired in 2001, after 24 years of service, including 15 years as Chief. He has been awarded a commendation by former Governor of the State of Wisconsin, Tommy G. Thompson for his life saving efforts.